I don’t think I’ll ever forget the first time I paddled a kayak across the north race from New Suffolk to Robins Island. From the beach in New Suffolk, it doesn’t seem very far to the sandbar on Robins Island, especially at low tide. But when you set out, you quickly become aware that the current is going to affect your course. As you approach the big green buoy at the end of the sandbar, you realize that you could be slammed into it by the rushing tide. It’s a little unsettling to think that the all of the water from the Great Peconic Bay has to turn sideways in a 30-foot deep channel just to get out from behind Robins Island through the north and south races. 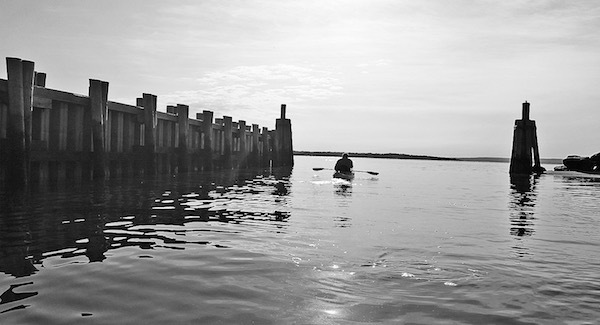 After deciding I wanted to kayak to Robins island, I began to research kayaks and quickly decided that Preston’s in Greenport was a place that had a very deep understanding of what it means to kayak in Peconic Bay. They quickly guided me into buying two Heritage kayaks that were 12 and 14 feet long and had the right gear. It’s just plain silly to go into salt water with a kayak shorter than 12 feet. The waves and the wind are not anything like paddling down a stream or across a lake. They also very wisely advised me not to get a fiberglass boat that would be quickly ripped up on the bottom by dragging it onto the rocky shores all around the bay. At first glance, the kayaks I bought didn’t look like professionally engineered boats, but I have come to realize that just because they’re not made of fiberglass and don’t have rudders doesn’t mean they are not very well suited for saltwater kayaking. For my first trip across, I enlisted the help of my second son James. He is an information technology director at Southampton Hospital and has a mind that is a good deal more scientific than mine. I thought I might need someone along who is more realistic and less prone to flights of fancy than I am. We set out from the beach in New Suffolk and quickly found ourselves in the middle of the current of the north race. The adrenaline rush kept us paddling hard. It took a quick ten or fifteen minutes to cross, and it was surprising how fast the bouy came up on us. We didn’t immediately realize that as we paddled south we were quickly slipping west towards the buoy. It took until we were within just a few feet of the sandbar for us to feel safe again, and we didn’t really have any choice about landing on the west side of the spit when we had originally planned on landing on the east side. 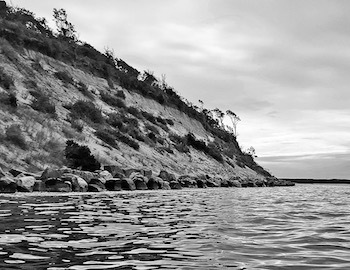 Landing nose first into the sand and jumping out of the kayak to pull it on shore was an exhilarating experience, and standing on Robins Island looking back at the shoreline of the North Fork felt like a colonial accomplishment. We shook hands and congratulated ourselves for being there. Robins Island is a strange and beautiful place. When you land there for the first time, you feel like you are the first person to have ever arrived. The birds look at you as if they have never seen a person before (all my imagination, I’m sure.) The sandbar contains miscellaneous brick pieces from the island’s distant history as a brick plant. 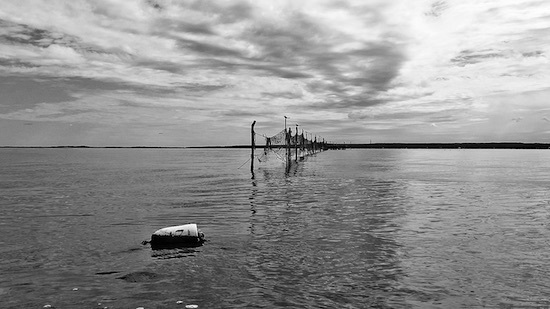 If you walk to the north end of the sandbar and into the water, you get the strange sensation that you are standing in the middle of Peconic Bay, as you look out at the North Fork, with the current rushing over your ankles. Robins Island as seen from the tip of the south sand bar. After a ten minute walking exploration, it was time to get back into our kayaks and continue paddling along the western coast of the island. Clearing the sandbar, there is next a small saltwater pond on the left. There are several osprey nests on the ground and a growing flock of oystercatchers. If you get too close to the osprey as they’re nesting, they really let you know it. At low tide, the pond empties into the bay, but at extreme high tide you can paddle in and explore the pond’s mud turtles, hunting blinds and driftwood. It’s very shallow, so don’t stay too long. Continuing to paddle south, you next come upon a series of small bluffs peppered with deer tracks, uprooted trees and holes that are the nests of some kind of mud swallows. On this side of the island you often see schools of fish in the shallows. I don’t know what kind of fish are lurking below, but sea robins jump out of the water from time to time. There are also a few large rocks just under the surface at low tide that you have to be careful of. There is often a wind out of the southwest, so you have to be careful that the swell doesn’t get too big on this side of the island. At a certain point, you risk capsizing when the wind is too high. The next section of Robins Island is perhaps the most stunning geographic feature. There is a section of clay bluffs that appears as a large wind-eroded swirl. It’s difficult to tell if it is a feature caused by the wind or if the original mud was somehow bent into a swirl and then the wind made it more obvious. Either way, it’s a pretty stunning sight. In recent years, the island’s owner, Louis Moore Bacon III, has chosen to place a large number of boulders along the the shore of the west side to discourage wave erosion. Some people think that was a controversial step to take, but the wide variety of shapes and colors of the boulders only add to the stunning nature of the west side of the island. Just past the bluffs, the south race comes into view. There is a long low section that leads to the south sand bar. If you look carefully, you can see a small shed on the island along the way. As you come up on the south race, there is a usually a large osprey nest on the ground and a section of the south sand bar filled with plovers. The south sand bar is almost always filled with a variety of sea gulls and cormorants. The cormorants spread their wings as you come up and invariable fly off and circle around until you have vacated the area. It’s a good idea to portage across the sand bar. The current around the point can be really stiff and it’s good to save your strength. From this point you can see Southampton and many of the features of the South Fork very clearly. We usually sit on the sand bar, have a sandwich or a snack and a long drink of water or Gatorade, before we shove off for the second half. The south bar is also a good place to have a swim if it’s hot. The east side of the island is almost always a good deal calmer. It’s sheltered from the usual breeze and the water is sometimes like glass. The island view is a long low woods and it looks like something from the distant past. The incredible value of residential waterfront on Long Island makes this one of the few places left where the woods come up to the beach. You can hear lots of inland birds and the shore often has flocks of geese with their young. Nassau Point is very visible to the right. Pound traps on the east side of the island. This side can be a long paddle it it’s hot. As you come back near the north race, there is a protected cove to the left and the Robins Island dock. You can see the main house and the guest house back a ways in the woods on the island and New Suffolk is clear in the distance across the race. A word of caution… it’s best to do this trip before 10 a.m. As the day progresses, the wind tends to pick up. More than a few times, I’ve come up to the north race, out of the shelter of the island and found a dramatic change in the environment. The wind can be whipping in from the southwest and the waves can get dangerous. It takes about twenty minutes of steady paddling to cross the race from this point and if the waves are running perpendicular to the kayaks you run the risk of capsizing. That said, the last leg home is usually a joy, if you take your time and pace yourself. There have been times when the wind is coming from behind and you feel like you’re surfing as you come into New Suffolk Beach. I‘ve had the same kayaks and paddles for about 12 years now, and I feel no need to get new equipment. Kayaking around Robins Island usually takes a leisurely two-and-a-half hours. I’ve done it now probably more than 100 times with 40 different people. It’s a great adventure and I recommend it to anyone who knows how to be careful. It’s one of the few places left where you can go and feel like you are the only person around. It’s like taking a step back into the past.